Relevant records are items that define and are most likely to be reused for a case or data type. Relevant records help to define the information that is displayed in certain Pega™ 7 Platform application windows and fields. Pega 7 Platform provides a number of items that are marked as relevant records. You can also add records for your contextual class by using the Relevant Records landing page. 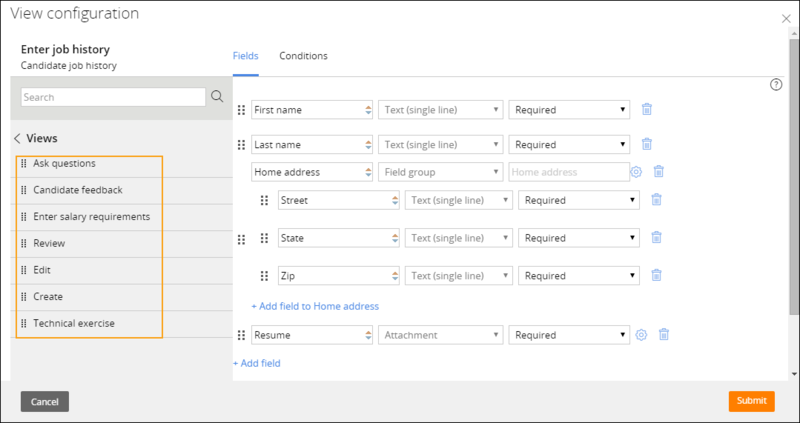 Fields (also known as properties): You can define relevant fields in a case or in a data type. Views (also known as sections): You can define relevant views in a case. Processes (also known as flows): You can define relevant processes in a case. User actions (also known as flow actions): You can define relevant user actions in a case. Correspondences (version 7.4 and above): You can define relevant correspondences in a case. Records are automatically marked as relevant when you create them by using Data Designer or Case Designer. In Data Designer, click Filter and select the Show relevant records check box to display the relevant fields (properties) for a data type. Data Designer displays only relevant records that are directly defined on your data type. To see relevant records defined elsewhere in this data type’s inheritance path, click Filter and select the Show inherited check box. 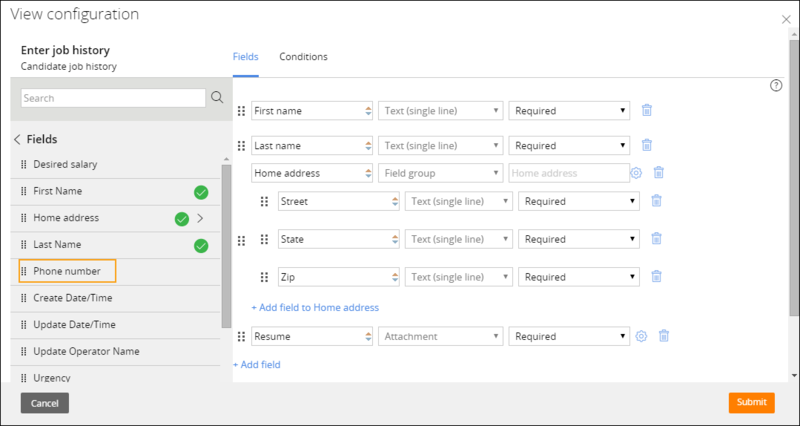 Data Designer in express mode displays only fields (properties) that are marked as relevant records for the selected data type, with an option to display or hide relevant fields that are defined at inherited classes. Internal fields are not displayed. 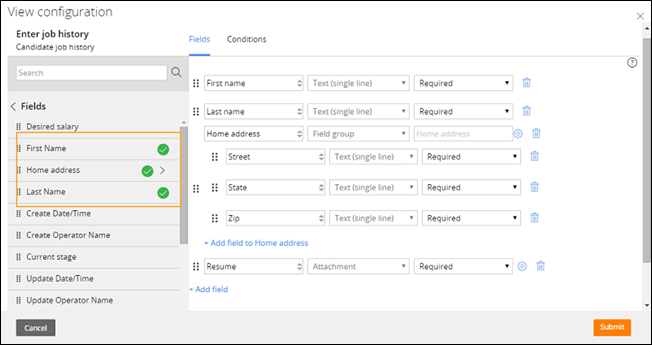 In Case Designer, the Data model tab displays only relevant fields (properties) for the selected case type, with an option to display relevant fields that are defined as inherited classes. 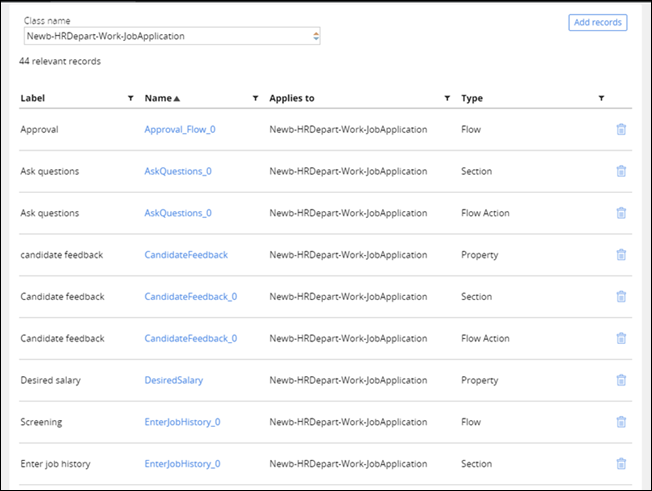 On the Life cycle tab, when you configure a form by selecting an assignment, and then click Configure View, the Fields list displays the fields (properties) that are sourced from the relevant records that are configured on the current case type. 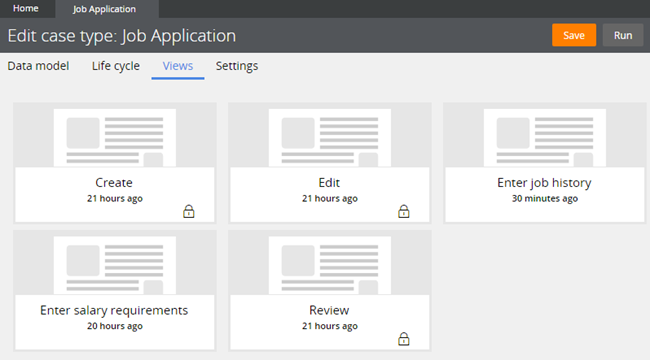 On the Life cycle tab, when you configure a form by selecting an assignment, and then click Configure View, the Views list displays the views (sections) that are sourced from the relevant records that are configured on the current case type. 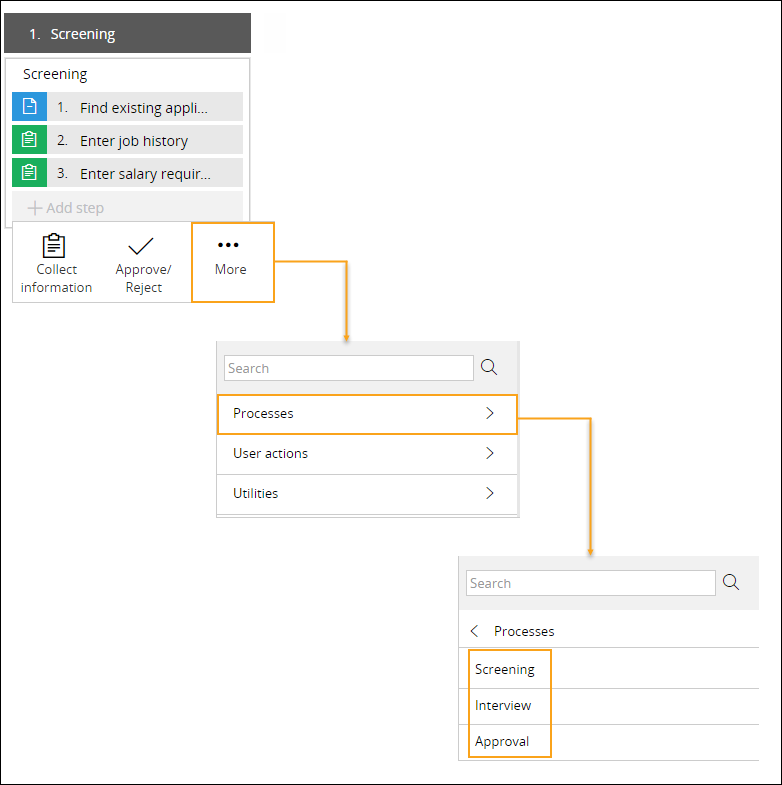 On the Life Cycle tab, when you click +Add Step, and then click More in the step palette, the Processes list displays the flows (processes) that are sourced from the relevant flows that are configured on the current case type. 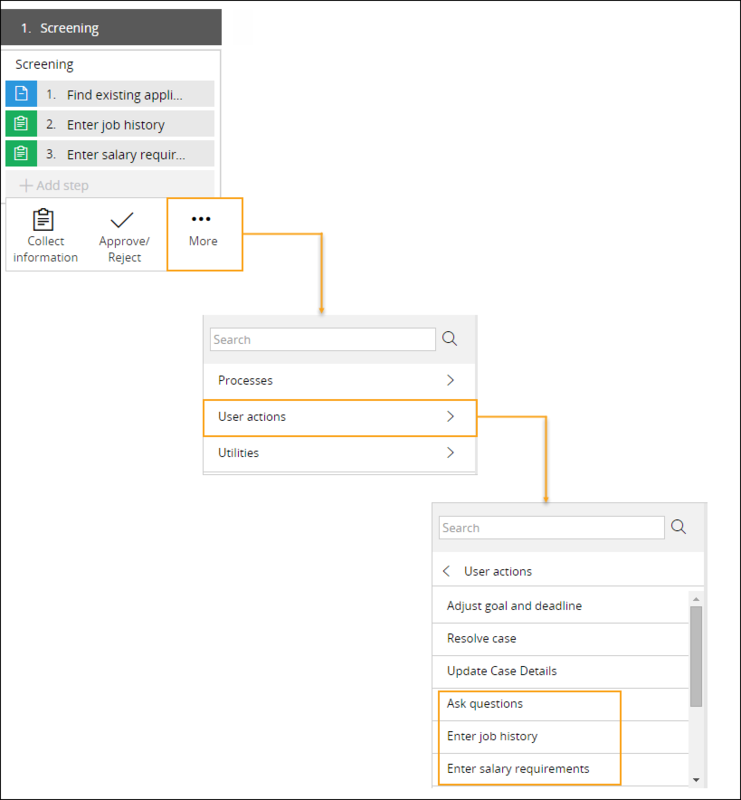 On the Life cycle tab, when you click +Add step and select More from the palette, the User actions list displays the flow actions (user actions) that are sourced from the relevant flow actions that are configured on the current case type. The Views tab displays the sections (views) that are marked as relevant records for the current case type. You can manage these records on the Relevant Records landing page, which you can open by clicking Designer Studio > Application > Inventory > Relevant Records and selecting the case type in which you want to work. You can add or delete records from this page. Add new records by clicking Add Records and selecting the type and name of the item that you want to add. Newly added relevant records appear in the appropriate areas in Pega 7 Platform. For example, if you added a property as a relevant record, it appears in the Fields list when you click the Life cycle tab, select an assignment, and click Configure View.